TwitCasting lets you stream live video for free right from your Desktop, iPhone & Android. Try TwitCasting Live to share great moments with your friends and followers. moi ... means "hello" in Finnish. There is lots of great content to enjoy among the many people live streaming on TwitCasting. You can watch wherever you are – from your PC, your iPhone & Android, and even from your tablet, as long as you have an Internet connection. You can install an app, or watch our live streaming from your browser, anywhere, anytime. as long as you have an internet connection. Click here - How to watch - for more detail about finding and viewing live streams with the content you're interested in. You can watch live streams without registering, but to post comments and share, you need to sign in with either your Twitter or Facebook account. Signing in is EASY - just press the Sign in button. Your TwitCasting account will be created instantly and you can communicate with anyone who is broadcasting. Click here - How to Join - for more detail about joining a live stream. Every broadcaster has a Twitter and/or Facebook account. They usually post an initial notification message to Twitter or Facebook when they start their live stream, so the best way to get a notification is to follow them on Twitter or Facebook. You can also install the TwitCasting Viewer App to your iPhone or Android and receive notifications there. If you want to get notifications on your PC, you can install the TwitCasting Alerts software and receive messages there. Click here - How to get Notifications - for more details on receiving notifications from the broadcasters you like. All you need is a Twitter or Facebook account and you are ready to begin live streaming on TwitCasting. You can stream your first broadcast from your iPhone, Android, tablet or PC. Click here - How to Live Stream - for more details on broadcasting. Watch Live Streams on your Browser! You can browse all of the live streams on TwitCasting from our home page, using the standard iPhone, Android or PC browsers. Watch Live Streams from our Viewer App! 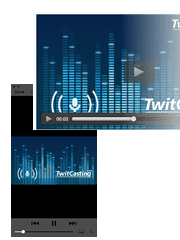 Download our TwitCasting Viewer App for the best experience! Posting comments and sharing with your favorite broadcasters is easy when you're using it. Click here - Download Apps - for more detail about downloading the Apps. You'll see ‘Featured Users’ on the TwitCasting Viewer App when you click on the Search icon. This is our list of recommended viewing, taken from the Popular Lives list. This is a great introduction to interesting content on TwitCasting. You will see ‘Popular Lives’ and ‘Recent Lives’ as soon as you open your TwitCasting Viewer App. On your PC, you can find them on the TwitCasting homepage. Popular Lives are the broadcasts with the most views and ‘Recent Lives’ are those that have started most recently. You can also search for a particular user, category or tag. Broadcasters can choose Live Video or Live Radio (music) mode for the best sound quality. They can also choose to let viewers broadcast with them (Collabo). You'll see a category icon for these on each Live. Broadcasters can also tag their live streams with descriptive terms so that viewers looking for that content can search for and find it. Click here - How to Join - for more detail about joining the broadcast. You can sign in to TwitCasting with your Twitter or Facebook account just by clicking the Sign in button. You can post comments during a live stream and your comments will be shared with all of the viewers in real-time on the Comments Feed. Your comments will also be posted to the broadcaster's Twitter feed (or Facebook wall) – or, to disable this, just uncheck the 'Post Twitter' (or Post Facebook) check box in Settings. Have fun communicating with your favorite broadcasters while you watch or listen to their live streams. 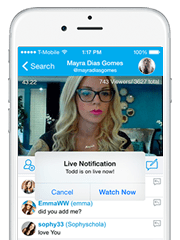 Click here - How to get Notifications – for more detail about receiving a message when your favorite broadcasters go live. Push Notifications will be sent out when a broadcaster that you have subscribed to starts their live stream. You can receive these on your iPhone, Android, tablet or PC. Install the TwitCasting Viewer App on your iPhone or Android to receive push notifications there. Download the app and subscribe to your favorite broadcasters. That way you will be notified every time they go live! You can find your favorite broadcasters either by searching for them by name or by clicking on the subscribe button under their broadcast. You will need to install TwitCasting Alerts to get notifications on your PC. TwitCasting Alerts is free and is supported on both Windows and Mac. Once you have installed TwitCasting Alerts, you will see the green icon on your systems tray or Dock menu. Open the settings menu by double clicking on the icon. Click here - Download Apps - for more details about downloading the Apps. Click here - How to find Content – for details on finding content. It is super-easy to follow your favorite broadcasters on TwitCasting. All you have to do is Subscribe or become a Fan. Subscribing to a broadcaster gives you a notification every time that person goes live! If you really like a broadcaster, you can become a Fan and be listed on their Fan Page. You can select a Category to see the Lives in that Category. On the TwitCasting homepage, you'll find a list of tags describing the current broadcasts. Clicking on any tag gives you a list of all of the lives with that tag. You can also search for a tag or category on our homepage or on our app. You can check the Daily or Weekly Ranking on the TwitCasting website. This will direct you to the highest-ranking broadcasters on TwitCasting. A great way to find out what is happening in real-time is to explore ‘Popular Lives’. 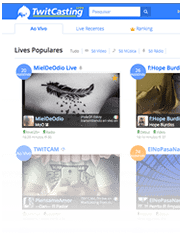 Popular Lives are the most popular current live streams that appear on the home page. You can view Featured Users when you press the search button (or click on Featured Users on Android). You can discover content that you enjoy by clicking through the different broadcasts on this list. Every broadcaster has a level. This level is determined by how much time they have spent broadcasting and how many viewers they have. 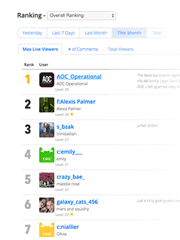 Level may also show you which broadcasters have the greatest amount of Subscribers and Fans within TwitCasting. Click here - How to Live Stream (Broadcast) - for more detail about broadcasting (we also refer to this as live streaming). Download the TwitCasting Live App and you are ready to broadcast from your iPhone, Android or tablet. 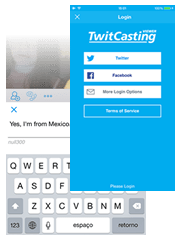 TwitCasting Live is designed to dynamically adjust to network quality so that you can enjoy broadcasting and sharing with your friends even on an unstable 3G network. Get ready to broadcast from your PC by signing in with your Twitter or Facebook account. Then just click the Broadcast button to start your live stream. Of course, you need to have a web camera and microphone to live stream. Be sure to allow Adobe Flash Player Settings access to your camera and microphone. 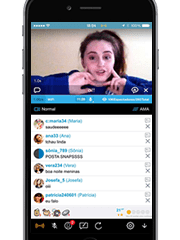 Private Live allows you to share a broadcast with just the people you want, by protecting your live broadcast with a secret password. Only people who have that password will be able to join your live stream and communicate with you. You set that password or “secret word” on the settings menu of your TwitCasting Live App (or under Advanced Options on your PC when you select “Broadcast”. Just enter your choice of password in the “Protect by Secret Word” field, send that password to the people you want to join and start your broadcast. The first second of your live stream will be used as your thumbnail picture on the TwitCasting website. Get ready and remember to smile! All of the live broadcasters have a level. This level is determined by how much time they have spent broadcasting and how many viewers they have. Your level will increase the more time you spend going live. A new level will appear at the top of your screen each time you advance so be sure to check your level each time you broadcast. TwitCasting has Live Mode options at the top left hand side of the TwitCasting Live App. By default, we display the network quality (for example, Standard) but you can change it to Radio, Collabo or whatever other option you like. The higher your level, the more Live Mode options will be available to you. Click here - Download Apps – for more details on downloading apps. Search for "TwitCasting" in the App Store. Search for "TwitCasting" in Google Play. You can install TwitCasting Alerts from the following page. Click here - Help Page - for more details and additional support options. Welcome to TwitCasting! Here's what you can do with TwitCasting! Please refer here for TwitCasting Viewer Help. Please refer here for Frequently Asked Questions. To learn about the ‘Subscription’ feature which helps you get more fans.